Fashion watches are a tricky business. They look stunning but aren’t the most functional (especially in terms of complications). To add to that, some watches follow trendy designs that tend to fade, which is why fashion watches aren’t known for their longevity either. However, since they are relatively inexpensive and have premium designs, fashion watches have been a staple for those young and in vogue. When it comes to fashion watches, not a lot of brands do it better than the legendary Armani Exchange, and we take a look at a couple of watches in the collection in this detailed review. One of the most important aspects of a watch’s design for me is by far the contrast, and the AX2137 possesses one of the most timeless color combinations of all time: black and gold. As stated earlier, fashion watches are not known for their longevity and overall functionality, but they are known for their stunning designs. 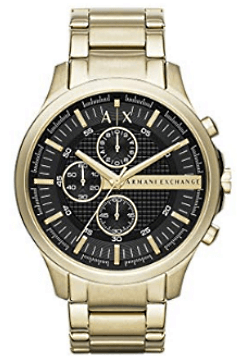 The AX2137 features a goldtone stainless steel case and band, which harmonizes perfectly with the black dial with golden markers, hands, and subdials. The quartz watch features the iconic “AX” logo at the 12’oclock position and the words “Armani Exchange” printed in gold at the 3’oclock position. While it’s expected that this watch would look great on the wrist, it doesn’t fall short in function either (like a lot of fashion watches), as it uses the ever accurate quartz movement, has a tachymeter, and is water resistant up to 15m. 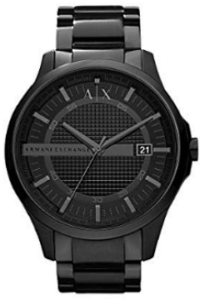 The AX2137 looks perfect paired with a black suit, and would also be the best watch for any formal function. While a lot of fashion watches are designed with a specific style in mind, once in a while there comes a fashion watch with a truly flexible design, and that’s exactly what the AX2135 is. The watch’s flexibility stems from its color, the neutral and elegant grey that’s on the stainless steel band and case, along with the ion-plated gunmetal bezel, make the watch blend in with almost any outfit while still looking beautiful. The face of the watch is also grey, with black markers and a date window at the 3’oclock position. At first glance, the watch may seem hard to read because of the color choice, but the black markers and hands make it surprisingly easy to read. The case measures 46mm in diameter which is pretty large, but the large men’s watch has been making a comeback in recent years, and despite its size, it looks great on the wrist. One thing this brand does not fall short on with their watches is class, and it can’t be more evident than in the AX2132. For starters, stainless steel case and band shine very brightly and look great with both formal and casual wear. The navy blue face of the watch contrasts beautifully with the case and makes the watch really easy to read. 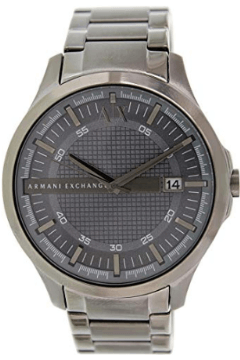 On the face are silver markers and hands, with the words “Armani Exchange” printed at the 9 o’clock position on a silver band that runs along the watch face, ending at the 3 ‘o’clock position, where the date window is. The case measures 46mm in diameter which is the size of most large men’s watches, which is a great fit on an average man’s wrist. When it comes to function, this watch covers the basics, which is accurate time-keeping (powered by a quartz movement), and a date window. Just the basics. Nothing more, nothing less. When it comes to style, a lot of times less is more, and this watch says so much by being incredibly simple. The watch has a standard quartz movement, mineral crystal, and a beautiful gold on black design. The stainless steel case, bezel, and strap have a deep black color, which is the same for most of the watch’s face, as the only other color on this watch is the gold hands, markers, and the printed logo at the 12 o’clock position. This watch is arguably one of the best watches to pair with a suit, and would definitely turn heads at any formal event. Every season, we hear that this color or that trend is the new black. The reason being, the color black in fashion is absolutely immortal. The color can go in virtually in any outfit and it’s this versatility that made the color so popular in design. 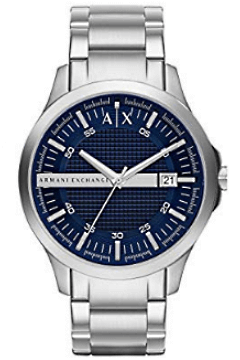 Armani Exchange perfectly used the color in the AX2104, by using the color on almost the entire watch except for the numbers on the date window. This is a large men’s watch, so it’s expected that the case’s diameter would be large, which it is. The 46mm case, which is stainless steel colored black, does not look large at all on the wrist, and despite the color palette, the face is very easy to read. This is because the designers of this watch chose the perfect shades of black to blend together perfectly. 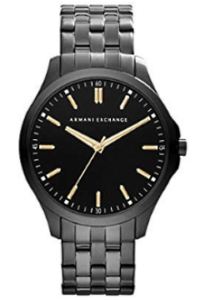 As mentioned above, if you’re looking for longevity and an insane amount of complications in a watch, then the Armani Exchange line and most fashion watches will not be for you. But for those who want premium design quality, at a great value, then fashion watches are something you need to get in to, and there’s no better introduction to the world of fashion watches than the Armani Exchange Hampton watch line.